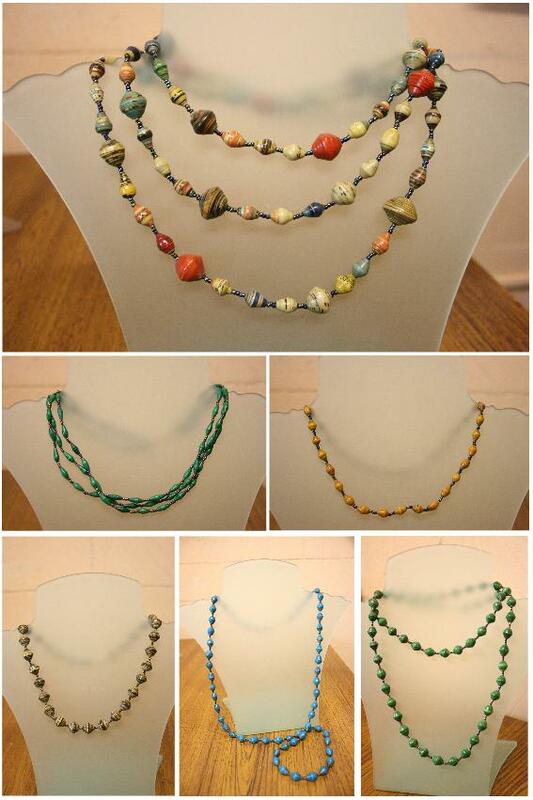 I recently got these special necklaces and bracelets into the bookshop I manage. They’re not only special because each piece is beautifully handcrafted out of old magazines (I love recycling!). Neither are they just special because I LOVE the colourful designs, and I have received many compliments every time I wear my new multicoloured necklace. What makes these crafts special is that they help provide these amazing children with an education. 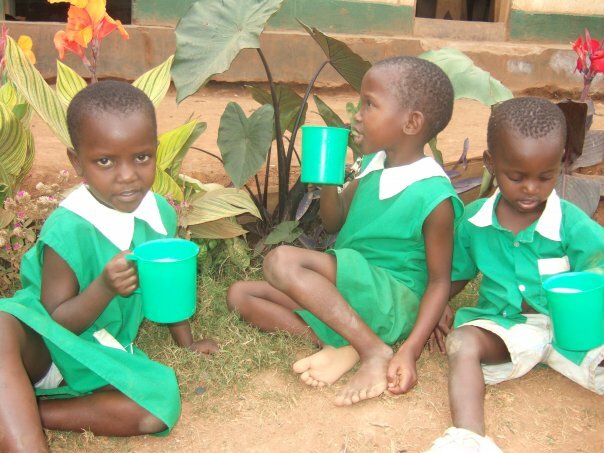 These children attend the Goodwill Community School, which is run by Tentmakers Ministries in Uganda. 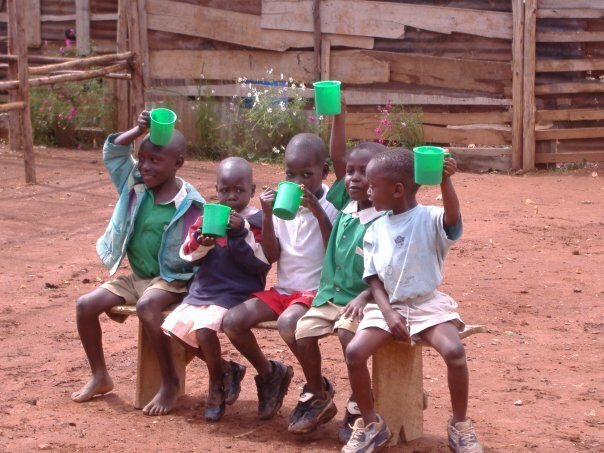 This organisation aims to empower children and to give orphans the chance of education, and a better start in life. 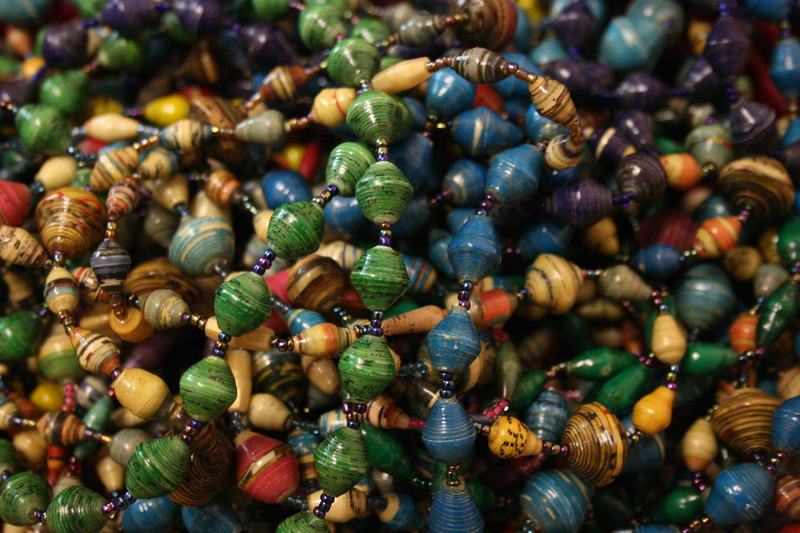 The children love to get together to fold up brightly coloured paper from magazines into beads, which are then varnished and strung into necklaces and bracelets which we can buy. 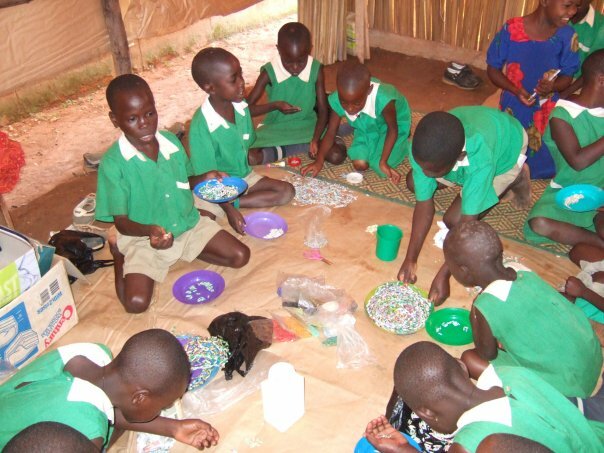 The money goes towards providing food for the children while they are at school (they wouldn’t eat during the day otherwise), paying school fees for those without families to provide, and for equipment for the school. 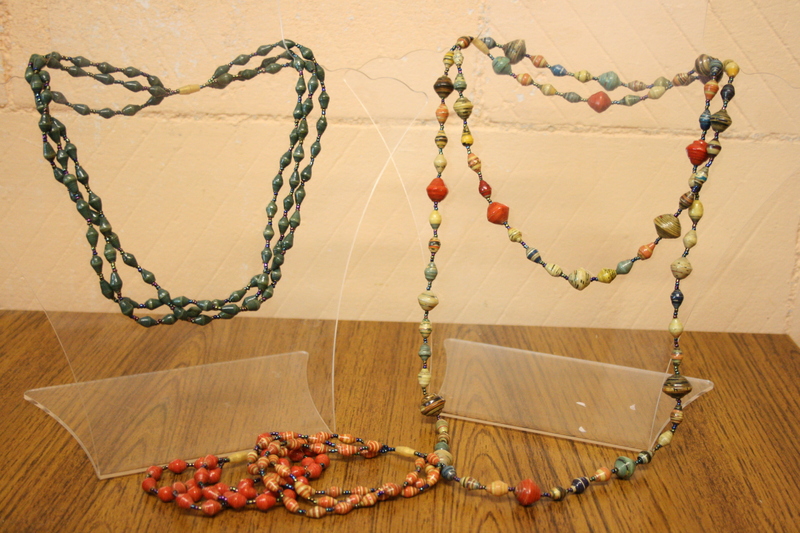 I want to help these children by selling as much of this jewellery from my bookshop as I can, and because there are only so many necklaces I can wear, I have decided to give away a necklace to one you, my dear bloggy friends. The contest is open to people all around the world, until 10pm (GMT) on Friday 2nd April and I’ll announce the winner on Saturday. I’m really excited about this giveaway. 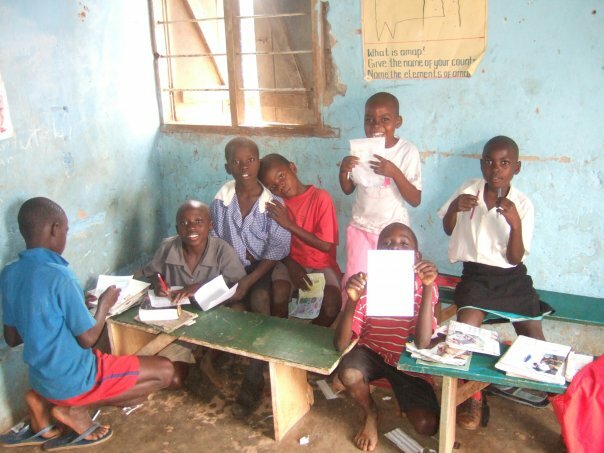 Without this project many of these children would have no access to education at all. Ok, I love all those necklaces!! But my fave is the long green strand! I like the long blue strand the best. I used to make magazine beads in high school, but these are so much better looking than anything I ever made. I feel like I should play it safe and go with one of the shorter strands, but there’s something about that long colorful one that I really like. No I haven’t read integrity by J Lamb. See you next week. Hey, I didn’t know you managed a bookshop! That’s very cool and I must admit I’m quite jealous. Out of the necklaces I like the long green one, the last in the picture. Long aqua-marine strand (for Rachael, obviously). 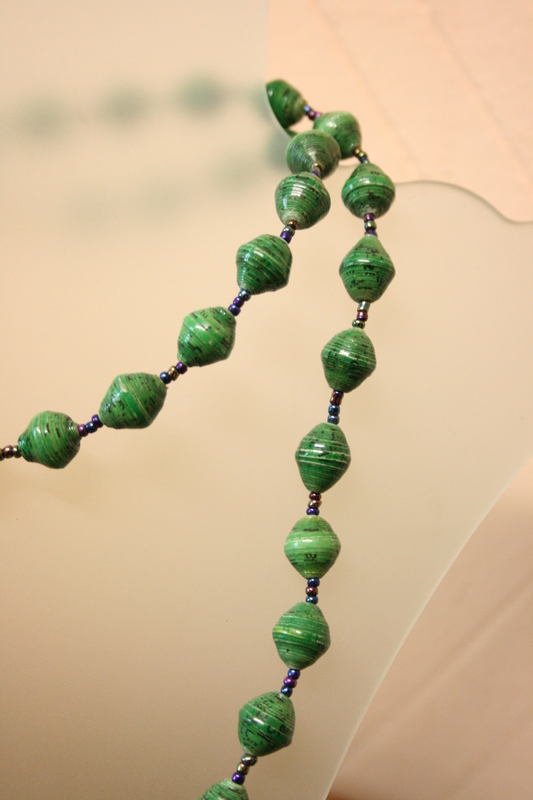 I love the short green triple strand necklace! I love that these not only help the environment through recycling, but also help humanity by providing education where it is most needed. Awesome efforts! Seriously? You’d send one to me in the States if I won?? THANKS! I LOVE those necklaces! My co-worker’s daughter lived in Africa for a few years and brought back some like these. They’re so beautiful! Anyway…I would pick the multi-colored (I mean coloured) one for myself. It would go with everything! What beautiful pieces with a great cause! I adore the multi stranded short green one! I love the short green triple strand, love the design n the colour it’s very greeny hehe! This giveaway is awesome! What amazing necklaces! I’m loving the long aquamarine strand! They are all beautiful but I’d have to pick the triple strand. How cool that you sell these at your store! Being your boring Mother in law I like the short chunky yellow/grey one. How much are you selling them for -praps we could ahve a few in our shop????? What a fantastic giveaway – yay for happy kids and beautiful recycling! Love love love the triple green – though they’re all fantastic. Thanks for the generous offer.